The Fringe is coming soon! Fear of death, making comedy and fighting prejudice are but a few of the topics Jewish community members will be exploring in their productions at this year’s Vancouver Fringe Festival, which runs Sept. 7-17. Seattle comedy couple Sophie Lowenstein and Clayton Weller are bringing Naturally to the festival. It’s not one show, but two, with audiences deciding which they want to see: the one about grief, which also contains a dating scene, “the worst theatrical audition ever” and more; or the one about what sketch comedy is, how to make it – and why to bother making it. According to the press material, Lowenstein and Weller have been performing comedy together for more than 12 years. In addition to Naturally, Weller runs two performance venues – the Pocket Theatre and the Slate Theatre – and Lowenstein works as a nurse practitioner. In one of the Naturally shows, Weller mentions that he once had a lucrative high-tech job that he gave up for comedy. Does he have any regrets? The couple has been doing Naturally for a couple of years now. “After every performance,” said Weller, “we can’t help but do the ‘Oh man, next time why don’t we blah blah blah.’ The script is never permanent, and every remounting of the material we go through a rewrite and punch up all the scripts. Also, finding new ways to fit it together is a whole other way to make the thing new for us. Mostly, we just like hanging out and this is a great excuse.” Lowenstein agreed. Naturally runs Sept. 8-16, at various times, in the gym at False Creek Community Centre on Granville Island. The 55-minute show is rated 14+ for coarse language and sexual content. 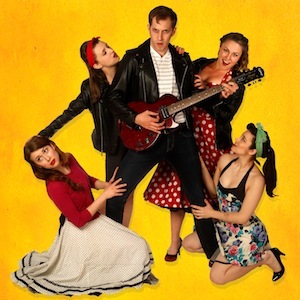 Running Sept. 7-17 at the Firehall Arts Centre, also at various times, is the Canadian première of Cry-Baby: The Musical!, which is being presented by Awkward Stage Productions. It, too, is rated 14+ for the same reasons. Jewish community member Erika Babins, who is artistic associate of Awkward Stage, choreographed the Fringe production, which features “a cast of 16 emerging artists” and runs 90 minutes. “It’s 1950s Baltimore, the conservative squares face off against the leather-clad delinquents in this rockabilly musical based on John Waters’ cult film,” reads the press release. The 2008 Broadway show was nominated for four Tony Awards, including best choreography, and won a Drama Desk Award for outstanding choreography. So, where does Babins begin? “I start my choreographic process by obsessively listening to the music of the show so that it can live in my body,” Babins told the Independent. “Before we start rehearsals, I’ll meet with the director and we’ll talk through the shape of the show so that we know what purpose each song serves in the show, where we’re coming from and where we’re going, and how we’re going to get there.